Cara Eisenpress is the blogger behind Big Girls, Small Kitchen and the co-author of In the Small Kitchen, published by William Morrow. People have accused me of having a love affair with salt. My retort (which I usually keep inside my head) is that I just like things with flavor. A preference for food with, you know, lots of flavor, has led me to seek out dishes that have the absolute most taste per square millimeter, and that search has led to making sun-dried tomatoes -- concentrated little morsels of tomatoes' sweet-and-savory-ness -- at home. Summer’s abundant tomato harvest begs to be preserved, and once you’ve exhausted tomato sauce, salsa, and tomato jam, sun-dried tomatoes are a brilliant solution. I took a longing look through White on Rice's post about actually sun-drying tomatoes with sun over the course of a couple of days. Then I took a long look at my apartment, with its shady fire escape and dusty windowsill, and I decided that my oven was going to be the vehicle for turning my fresh plum tomato slices into their chewy "sun-dried" alter egos. It was a fine choice, though you might argue that gas heat lacks the romance of sunshine. 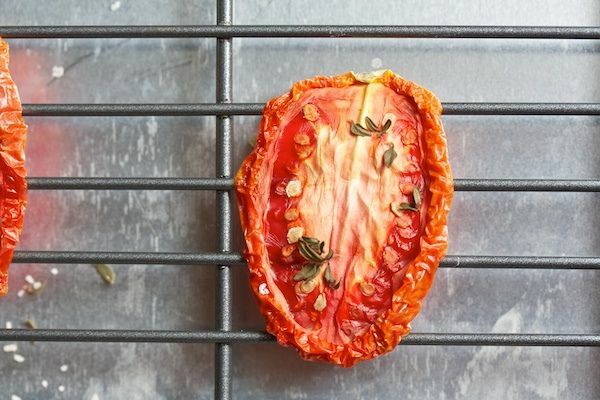 By slowly cooking sliced tomatoes at a low temperature, you zap them of their moisture, leaving raisin-like remains a third the size of the slice you started out with, and containing all of the original flavors. You don't add any olive oil, as you would when you're simply roasting tomatoes until they burst, but you do add herbs and my one true love, coarse salt. I start with plum tomatoes, cut into thirds. We all adore a big ugly heirloom or petite cherry tomato, but both have a bit too much water to make them practical for drying. In fact, I extract some moisture from the plum tomatoes before I even put them in the oven, using the same method as for sliced eggplant about to be roasted: salting, resting, and blotting. 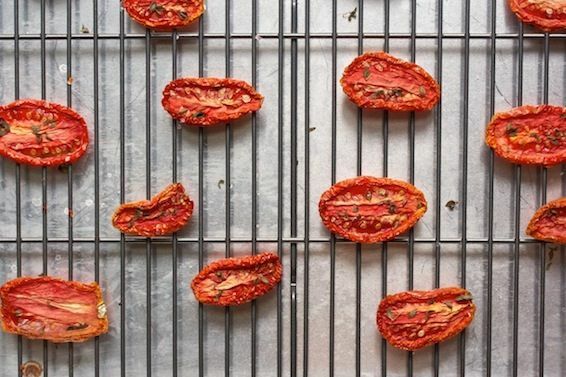 An important trick is drying the tomatoes on a rack, instead of right on the baking sheet. This way, hot air surrounds the fruit from all sides, preventing it from basking in its own juices, which could risk a loss of sweetness or a burn from the oven. And since you're taking the long route and making these treats from scratch, you don't have to rely on an antipasti bar's selection to make key taste decisions for you. If you like slightly plumper sun-dried tomatoes, remove them from the oven sooner; chewier, go longer. 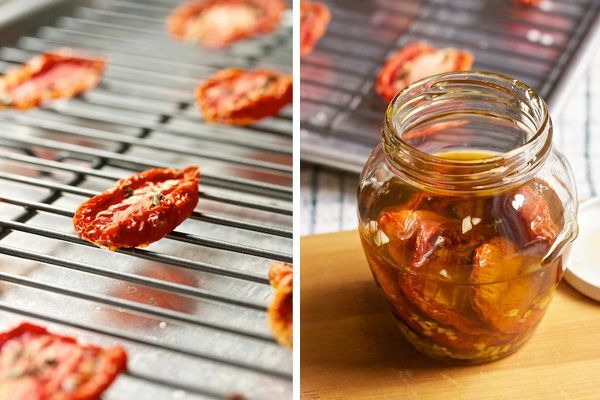 If you're always cursing the copious amounts of olive oil in your sun-dried tomato jar, you can skip the oil all together and store the cooled tomatoes dry, in a container in the fridge. I've steeped garlic in my oil to season it, but you can add hot pepper, oregano, or other dried herbs. Preheat oven to 200°F. Place a metal rack on a baking sheet. Cut each tomato in thirds lengthwise. Each slice should be about 1/3-inch thick. Sprinkle salt on the cut sides of the tomatoes -- not more than you'd want to eat though! 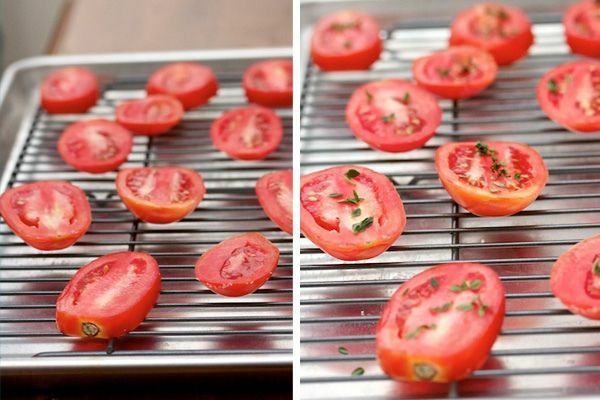 Line a cutting board with a dish towel or paper towels and place the tomatoes on top. Top with another dish towel and another cutting board. Weight with a heavy cookbook or two. The Food52 Cookbook or The Essential New York Times Cookbook are good options. Leave for 20 minutes. This helps get some of the tomatoes' juices out early, before they go in the oven. Remove the tomatoes from the cutting board sandwich, dusting off any salt that hasn't dissolved, and place them on the rack, with at least 1 inch in between. Sprinkle with the fresh thyme. Bake for about 5 hours, until the tomatoes are dry to the touch and have wrinkled around the edges. You can really decide how dry you want them -- as dry as raisins? Or do you want to leave a little plumpness? Watch them (and try them) as they cook, and decide for yourself. When done, remove from the oven and let cool to room temperature. If you're going to be storing your tomatoes in olive oil, place the olive oil and garlic in a small jar while the tomatoes are cooking, and let the garlic steep to flavor the oil. When the tomatoes are cool, add them to the oil. If you're not using oil, store them in an airtight container in the fridge. Cara will be answering questions about sun-dried tomatoes on the Hotline for those of you who want to take on this project at home. For the quickest response, go to her recipe and ask a question from there -- we'll email her your question right away! Don't miss next week's Small Batch, in which Cannelle et Vanille's Aran Goyoaga will show us how to make crisp, delicate ice cream cones at home. I'm the founder, editor, and head chef at the blog Big Girls, Small Kitchen (www.biggirlssmallkitchen.com), a site dedicated to easy-to-execute recipes and stories from a quarter-life kitchen. I'm also the author of In the Small Kitchen published in 2011. How long can they keep in the refrigerator? Its been almost a year since my last batch was made in the freezer, the double bagged ones are still great! I have been dehydrating all kinds of roma tomatoes from the farmers market and then freeze them flat in ziplock bags. Makes pizza sauce amazing and i also use them as a base for all my pasta sauces etc. Adds so much more flavor than using store bought tomatoes. Good post. 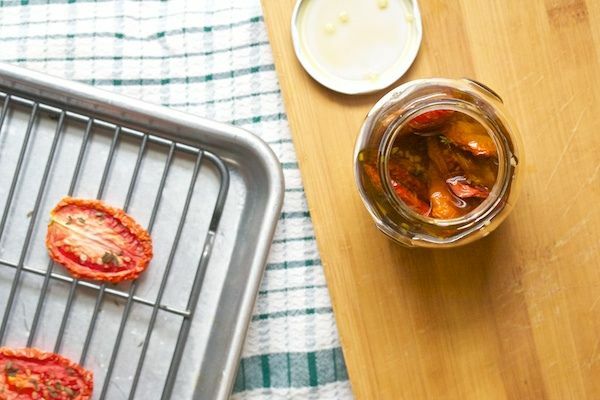 Our two cents on curing sun dried tomatoes in olive oil is that the home cook should really aim to use "sun dried tomatoes" Dehydrated or baked tomatoes in the oven aren't the same as proper roma, san marzano, or plum tomatoes dried outdoors in the proper conditions. If you don't live in southern Europe or parts of the southwest here in the US, then our recommendation would be to purchase sun dried tomatoes dried and packaged in Greece, Italy, or Spain. On the curing sun dried tomatoes in oil thread, the recipe is missing some key ingredients in terms of the traditional method as found in, arguably, the birth place of sun dried tomatoes cured in olive oil ; viz, southern Italy. Our recipe includes dried oregano, and fresh basil leaves. You also missed the packing process which includes layering sun dried tomatoes in the glass container. 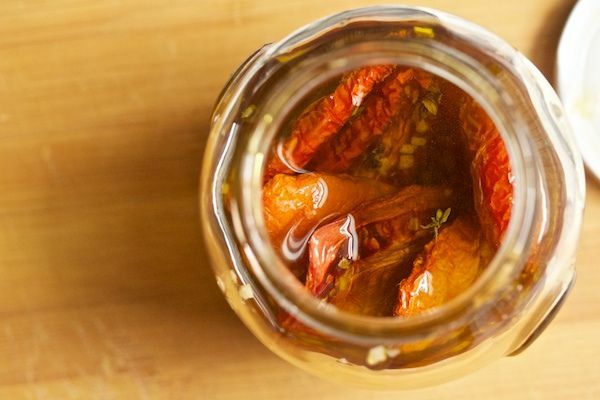 The technical line on preserving sun dried tomatoes in olive oil is that you should refrigerate but this will not just destroy the small chance of bacteria but it will also destroy all flavor. So while many food safety authorities advise against preserving tomatoes and garlic in oil due the risk of bacterial contamination and proliferation of spores, especially clostridium botulinum, which could be fatal, we suggest that you become meticulous with cleaning your canning equipment and only use a clean utensil when retrieving the tomatoes (in addition to proper storage). Thanks, Cara. Do you consider these to be shelf stable (no refrigeration) when stored in olive oil? I was too worried to try (see Chef Lynchini's comment below) - but I know some people have done it. Me, I preferred feeling safe with refrigeration. In my research on the topic of canning sun dried tomatoes, I came across a statement that canning in oil should not be attempted as the oil itself covers and assists bacteria in surviving the canning process. Sorry that I cannot quote the exact source, but it is advice I will certainly take to heart. For my money, the best long term non-frozen preservation method is complete drying and then vacuum packaging. Partial reconstitution in a little water, and then immersion into olive oil and viola, you are back in business any time of the year. Yes - exactly why I chose the path of refrigeration. I know some people will store in very clean jars, in oil, at room temp. But I was too worried to try. Awesome! Glad to hear you've enjoyed em! These are beautiful, Cara -- and I love the idea of getting a head start by salting the tomatoes.